Discover cultural tours in Greece in May 2019, visiting places like Athens and Delphi. Book now and save with TourRadar.com! 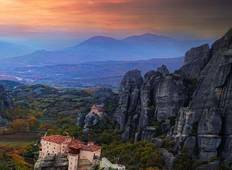 "The tour covered all aspects of Classical Greece as well as Mystras and Meteora...."
"fantabulous 2 weeks! epic adventure. Courtney went above and beyond any guide I've..."
"The trip and place itself was amazing! The guide was on her first tour so that was..."
"We are extremely happy with the tour. Our guide Anastasia was excellent very knowledgeable...."
"I took the 5 day greece tour from Fez Septmber 2017 Airport pick up was prompt. I..."